I am probably the last person left on the planet who had not read So You Do Not Want to Go to Church Anymore by Wayne Jacobsen aka Jake Colsen. I finally tackled it in its entirety last weekend. 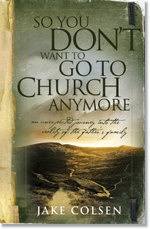 In case there are one or two of you left who have not read it, it is available online free here. Jacobsen’s tour de force is his ability to deliver crushing blows to religious systems. He may not always give us clear direction into the Promised Land, but he certainly helps free us from the Egypt of religious and institutional thinking. “But can we do it on our own? Don’t we need some help?” Marsha asked. This book also has an excellent chapter on children… take a look for yourself if you’re interested. 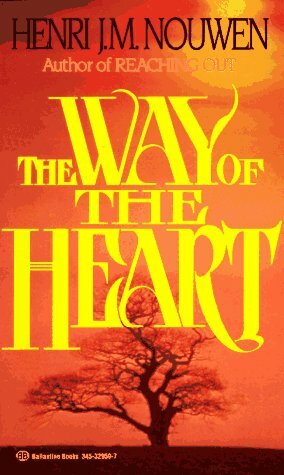 Reading Henri Nouwen’s “The Way of the Heart” was the beginning of moving me and my wife toward simple church. His chapter, entitled “The Compulsive Minister” provoked the start of a longing for an inner transformation. Years later, when God blasted us out of our traditional church roles, we were searching not so much for a new way to “do” church but a spiritual life that was free of the compulsiveness that Nouwen describes. I reflect on this today because it reminds me that the heart of the matter is always inner transformation… not just a switch to a different form of church. I am also reminded that I need to continue to hold up Nouwen’s words as a mirror to my soul to keep me free of the false motivations that can still sneak up on me. Nouwen goes on to suggest that solitude provides the primary furnace of transformation that can free us from the compulsions of the world by allowing us to find our true identity in an encounter with a loving God. Out of this transformation comes a ministry life based solely on compassion. Now that would be going straight to the heart of the matter.